i Click 'view all' to instantly compare this ok deal with offers on other top refracting telescopes. 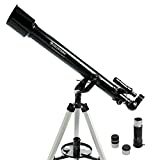 Gskyer Telescope AZ70400 German Tech is currently selling at $70.00, which is its normal price. It has a lowest price of $70.00 and is selling within its usual range. Price volatility is 0.15% (meaning it does not change often), so you might have to wait a while for the price to drop. Until then this is a recommended 'ok deal'. The current deal is also the best price on this item over the last month. 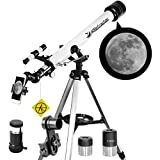 Compare the current price, savings (in dollars & percent) and Buy Ratings for the top Refracting Telescopes that are closely related to Gskyer Telescope AZ70400 German Tech. Here is how Gskyer Telescope AZ70400 German Tech compares with other leading Refracting Telescopes. General Features Optical Design: Refractor Aperture: 70mm(2.75in) Focal Length: 400mm(15.7in) Focal Ratio: F5.7 Eyepiece1: 25mm(0.98in) Magnification1: 16X Eyepiece2: 10mm(0.39in) Magnification2: 40X Max Magnification: 120 Finderscope: 5*24 Zenith Mirrors: 48°Erecting BAK7 prism Mount: Altazimuth Mount Optical coating: Antireflection Blue Film Barlow lens: 3X Resolution: ?3.1 Angular Field of View: 2°24"" Tuble connection: Altazimuth Mount Screw Tripod: Aluminium Alloy Tripod(can be adjustable) Shipping Weight: 2.8kg(6.17 lb) Item Dimensions: 24.8in*8.26in*4.33in Product DescriptionFor beginners alike, these refracting telescopes are a great way for you to discover the cosmos and the outdoors. 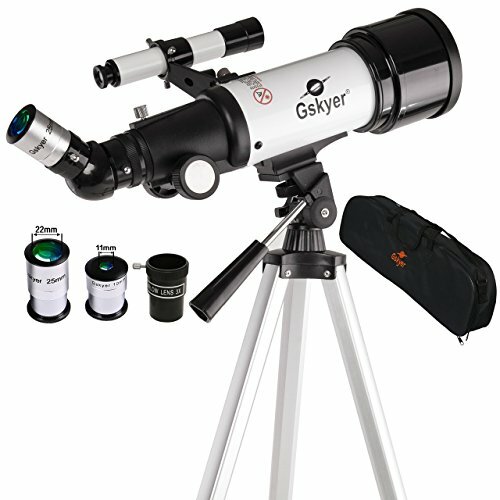 Details Gskyer telescopes are quick and easy to set up – even for the novice or beginners. All of Gskyer telescopes include a full range of eyepieces, it can help you see the stars more clearly. Gskyer telescopes are designed and manufactured using all fully coated glass optical components with high transmission coatings for enhanced image brightness and clarity. About Warranty 1-year warranty and lifetime maintenanceGskyer telescopes warrants your telescope to be free from defects in materials and workmanship for 1 year. We will provide the best service and reliable products to our every customer. And best quality at this reasonable price.Your satisfaction and positive feedback is very important to us if you are satisfied with our items and services. If you have any problems with our items or services, please feel free to contact us. We will do our best to solve your any problems and provide you the best customer services. FeaturesThe transmittance of optical filming glass optical lenses reaches 99.5%. It has clear imaging effect and stirring visual effect, it is particularly suitable for young people interested in astronomy.The lens is made from aluminum alloy and big-caliber non-dispersive and superior optical glass-ZF4. The lens is plated with multi-layer green film. It will not damage the vision even if use it a long time.The primary lens barrel is made from metal material and by using German latest technology. Allocated with environmental painting technology, it has the high quality and it is durable.The thickened aluminum alloy support is firm, stable and durable. 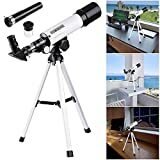 The height can be adjusted freely for you observing the star better..High-quality backpack, convenient to be collect the telescopes and protects the telescope better and prolongs the service life.